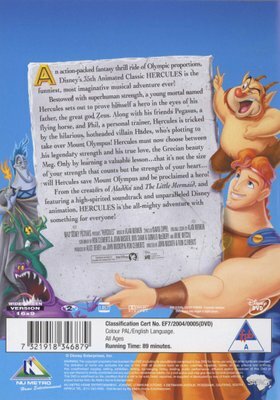 An action-packed fantasy thrill ride of Olympic proportions, Hercules is the funniest, most imaginative musical adventure ever! Bestowed with superhuman strength, a young mortal named Hercules sets out to prove himself a hero in the eyes of his father, the great god Zeus. 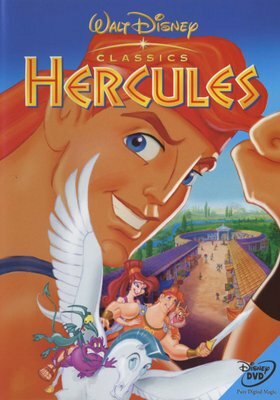 Along with his friends Pegasus, a flying horse, and Phil, a personal trainer, Hercules is tricked by the hilarious, hotheaded villain Hades, who's plotting to take over Mount Olympus. Hercules must now choose between his legendary strength and his true love, the Grecian beauty Meg. Only by learning a valuable lesson...that it's not the size of your strength that counts but the strength of your heart...will Hercules save Mount Olympus and be proclaimed a hero. From the creators of Aladdin and The Little Mermaid, and featuring a high-spirited soundtrack and unparalleded Disney animation, Hercules is the all-mighty adventure with something for everyone!